The American Duchess is an all-suite ship designed to cater to every need her guests may possibly have. This ship features some of the largest cabins available on rivers. Each Suite comes with its own bathroom, with most Suites having a private balcony to allow you to view the beautiful scenery as you cruise by. For guests staying in the Owner's or Loft suites, they are entitled to the exclusive 'Commodore Services' with pre-boarding privileges, preferred dining arrangements, a River Butler and many more elite services. Dining on board the American Duchess involves celebrated American chefs preparing exceptional meals with fresh ingredients to satisfy any craving. Meals are all held in the stunning 'Grand Dining Room', an opulent venue serving meals all day long. Classic American favourites can be found in 'The Grill', and for those who find themselves wanting a snack, complimentary 24-hour room service is also available. Dietary requirements will also be met. 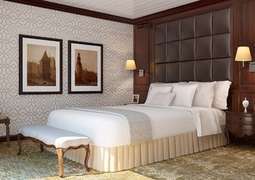 The 'Show Lounge' onboard the American Duchess delivers Broadway-worthy performances every night, as well as speakers who are invited to deliver knowledge on the local history of the areas you are cruising through. For those wanting to get their blood pumping, the 'Fitness Center' caters to that want. Weight training and aerobic exercises are offered with a selection of dumbbells, workout benches, treadmills and other equipment.